It's time to Play! I'm still loving my monthly Play! 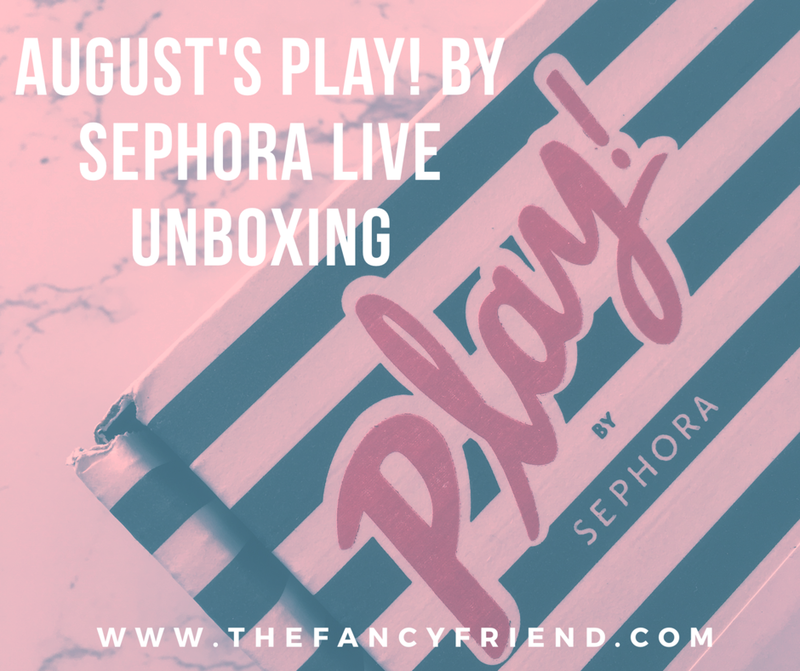 By Sephora subscription (You can find my other box reviews here and here). I switched it up a bit and did a live unboxing on my Periscope. Make sure you subscribe to my Periscope channel so you don't miss any other live broadcasts. Here are more details about the six products in this month's box and my first take opinions! Description: An energizing antioxidant liquid moisturizer that refreshes, protects, and hydrates tired skin for an instant dewy glow. Its unique formula is hydrating like a cream, concentrated like serums, and light like essences. Inspired by Korean skin care routines, this water-infused fresh moisturizer works to address the first visible signs of aging for radiant, refreshed, and healthy-looking skin. My Take: I'm not a fan of the dewy look, but I'll try it on a dry skin day. My Take: Currently, the only anti-aging concern I have are these dark circles under my eyes. So I'll definitely be trying this out. Description: A highly-blendable, gel-powder eye shadow and powder blush with vivid color payoff. With its breakthrough, gel-powder formula blended with ultrafine pigments, Artist Shadow leaves a smooth, even result that gives lids super-saturated, lasting color. My Take: If I wore eyeshadow I would try this. Note that only *some* of these eyeshadows double as blush and one in the box does not. Description: A contouring eye pencil for a big, beautiful look that lasts up to 12 hours. Enhance and enliven your eyes with the bold, long-wearing color of these eye pencils. The silky formula is resistant to water, heat, and humidity, ensuring up to 12 hours of smudge-less wear. My Take: I've used this liner before and I love it. I used the turquoise color and it's very pigmented and lasts a really long time. And this deep purple color is great for the fall. Description: An ultracreamy, lengthening, and volumizing mascara for stand-out lashes.The high-tech, volumizing brush separates and defines each lash for a clean, clump-free finish, and the triple-black pigments leave them looking intensely black. My Take: This is one of my top five favorite mascaras. It creates a clean, long, separated lashes. Definitely going in my travel bag. Description: Reserve Blend Warm Cotton is for those who currently love Warm Cotton or anyone who prefers to smell quintessentially clean. The fragrance envelops you in pure freshness that’s bright and comfortable. Its essence lies in the irresistible freshness of translucent florals and the soft feel of skin-loving musks for the ultimate feeling of luxurious comfort. Notes: Aldehydic Ginger, Watery Ozonic, Mint Green, Pepper Floral Accord, Musk, Incense, Vetiver. Style: Fresh. Comforting. Nostalgic. My Take: This smells like a very clean laundry mat. I'm not sure why we associated clean with cotton. Not for me, but if you like smells like Tide, go for it. What subscription boxes are you loving? Apr 25 One Year of Play! By Sephora! Is It Worth It?